In this week’s Blast from the Past interview, former Bafana Bafana goalkeeper Andre Arendse kicks us off into the new PSL season. Andre Arendse wins his fifth League title in RSA. It would have to be Lerato Chabangu. Best goalkeeper of all time? I’d say Iker Casillas, but also for the way he has captained his teams and led by example. Hardest shot you ever experienced? Nobody comes close to Eric Tinkler. When he used to take set pieces during Bafana Bafana training I used to have big trouble. I only had one season with him, but it was enough to hate the training. Paul Dolezar loved to make you run, but you got very, very fit. Best centre back you played behind? It would be Neil Tovey because of the way he managed defences. I never had to talk much when I played behind him. He made over 450 appearances as a professional footballer, winning 67 caps for South Africa along the way and also played for Oxford and Fulham in England. I went to watch Gavin Hunt put SuperSport United through their paces at a pre-season camp in Stellenbosch and my colleague and I were amazed by what we saw. Photographer Ryan Wilks played for Hellenic and Seven Stars with Hunt and has a strong view on the game in South Africa. *Momentum – They are the Nedbank Cup champions so this means they finished the season off sharper than any other team. They may have lost a few players, but have more than adequately replaced them. *Depth in quality –They lost Morgan Gould but signed Bevan Fransman. Out went Dipsy Selolwane while Ricardo Katza and Glen Salmon retired, but in came Clifford Mulenga, George Maluleka and Mark Haskins. There is enough cover in every key position in the squad. *Uefa Champions League experience – Bryce Moon, Sibusiso Zuma and Bevan Fransman have all played in the Champions League, adding crucial expertise to the squad. *Afcon 2012 winners – Who would have thought it? But Davies Nkausu and Clifford Mulenga were part of Zambia’s Africa Nations Cup winning squad. Sure, Mulenga was sent home early from Gabon & Equatorial Guinea and missed a gold medal, but if Hunt can get him focused he will be a huge asset. Watch George Maluleka very closely this weekend. He will play a central role in the MTN8 semifinal between SuperSport United and Orlando Pirates. Having drawn 0-0 a week ago, the sides will slug it out once again. 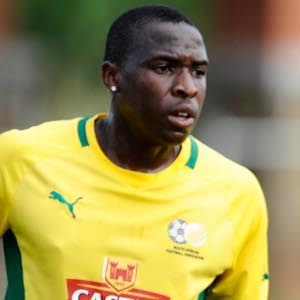 Maluleka has the ability to unlock Bucs’ stingy defence who will be missing suspended Rooi Mahamutsa. Having developed an eye for set pieces, Maluleka can do damage from any situation. I believe he will play a key role. Whether it be from a set piece, from a clever ball that cuts open the back line or whether he scores himself, the ex-AmaTuks man will be right in the mix. In the other semi, Moroka Swallows and Mamelodi Sundowns are locked at 3-3 from the first leg. In that game Lerato Chabangu starred for Birds and will be a key player again this time. Remember these KZN soccer stars? This Best of Natal football select played against Bafana Bafana in 1992. I can identify most of the players, but there are still some short. Can you help ID them all? Front row left to right: ? ?, Mark Davies, Solo Ndimande?, Shaun Dafel, Ace Nzimande, ? ?, Joe Mlaba, ? ?